Today’s post is by Shane Stansbury, the Robinson Everett Distinguished Fellow in the Center for Law, Ethics, and National Security (LENS) and a Senior Lecturing Fellow, here at Duke Law. Shane is no ordinary blogger on the issue of terrorism cases as he’s just completed more than eight years as Assistant United States Attorney in the fabled Southern District of New York (SDNY), where he was involved with a number of high-profile national security prosecutions. 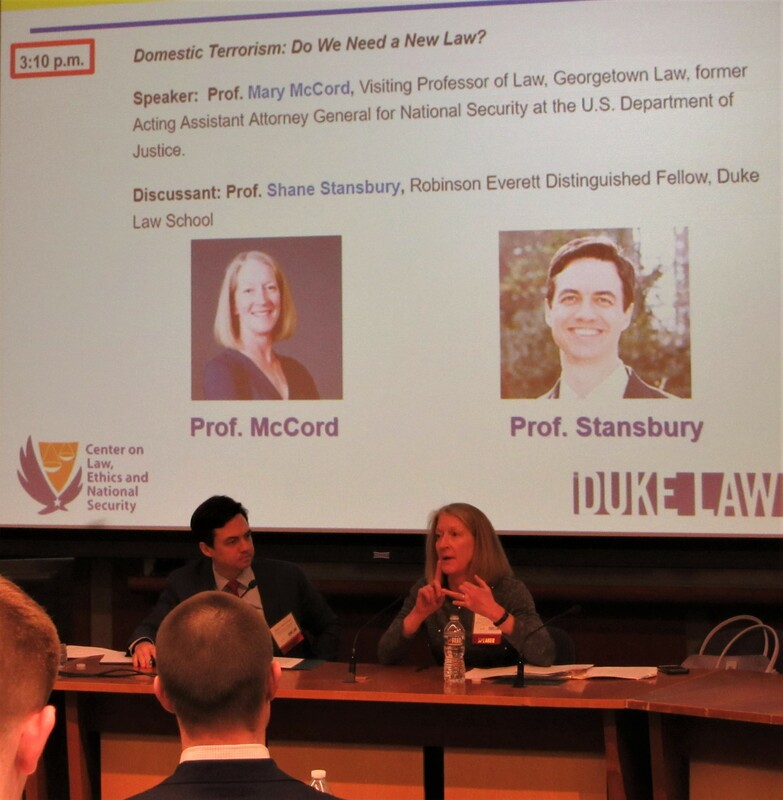 At our 24th Annual National Security Law Conference, Shane discussed with Georgetown Law’s Prof Mary McCord her proposal for domestic terrorism legislation. Shane reflects on that discussion (podcast here) and much more in his essay below. Over the course of the last few days, we have all witnessed our friends in New Zealand contend with the tragedy brought about by the mass shootings last week at two mosques in the city of Christchurch, leaving at least 50 worshipers dead and dozens more injured. Appropriately, the events have brought to the surface lingering questions about how best to address such violent acts of hatred, not only abroad but here at home. I prefer to hold off on commenting on the events in New Zealand until we learn more facts, but I’d like to use this moment to share some thoughts on the subject of domestic terrorism here in the United States. In particular, I’d like to offer some observations surrounding a question that has been debated on and off for several years now: Do we need a federal criminal statute prohibiting crimes of domestic terrorism? 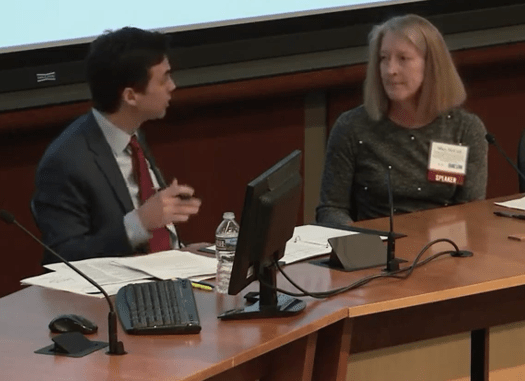 I recently had the opportunity to discuss this issue at Duke Law’s 2019 LENS Conference with my former Department of Justice (DOJ) colleague Mary McCord of Georgetown Law. 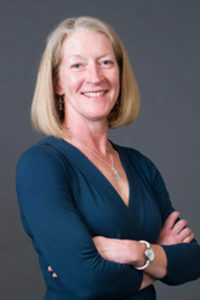 Until 2017, McCord was a career federal prosecutor who served in senior leadership positions at DOJ, including most recently as Acting Assistant Attorney General for National Security. Since leaving DOJ, she been one of the most outspoken proponents of a federal domestic terrorism statute. In our discussion, a video of which is available here, McCord explained why she believes a new law is necessary and provided a fairly detailed account of how the law would work. Whether or not one agrees with her, McCord’s thoughtful and nuanced proposal—which I discuss later in this post—is worth hearing. She and others who are offering concrete solutions have helped bring some needed discipline to a debate in which people are sometimes talking past one another. At a minimum, McCord has shown that we are long overdue for Congress to seriously consider what, if anything, we can do to better address the domestic terrorism threat here in the United States. McCord makes some compelling arguments in favor of a new domestic terrorism law. One of her main contentions­—which she has expressed in multiple posts on Lawfare, including in a recent post with Jason Blazakis—is that we need a statute that will place domestic terrorism on the same “moral plane” as international terrorism. Under McCord’s approach, serious violent acts like Robert Bowers’s killing spree last October at the Tree of Life Synagogue in Pittsburgh or James Alex Fields Jr.’s August 2017 deadly car attack at the “Unite the Right” rally in Charlottesville would be placed in the same criminal category as terrorist acts committed on behalf of ISIS or other foreign terrorist organizations. McCord also cites practical benefits that might result from a change in the law. By making domestic terrorism a crime, the FBI and other law enforcement agencies might be incentivized to devote more time and resources to addressing a threat that some say rivals, if not surpasses, international terrorism in terms of its impact on ordinary Americans. Moreover, by bringing these crimes under one statutory umbrella and requiring the kind of record-keeping that occurs in the context of international terrorism prosecutions, we might end up with better data to help us address the threat. This definition shares much in common with the companion definition of “international terrorism” in § 2331(1). In fact, the two are identical in specifying the type of motive required for an act to qualify as terrorism (e.g., to “intimidate or coerce a civilian population”). The incongruity lies in the fact that domestic terrorism per se is not a federal crime. That is not to say that justice cannot be had. As McCord acknowledges, prosecutors have no shortage of options when seeking to hold accountable those responsible for domestic acts of terrorism. For example, every state makes murder punishable by life imprisonment (and, in some cases, death), and some states even have their own terrorism laws that cover domestic offenses. And as Bowers, Fields, and others before them have learned, the federal hate crime statutes, which are punishable by life imprisonment or death, provide a powerful tool for prosecutors. Some point to these statutes as proof that we do not need another federal law on the books. There is some appeal to this if-it-ain’t-broke reasoning. After all, the FBI, guided by the definition in § 2331(5), does conduct “domestic terrorism” investigations, even if the activity being investigated does not end up being prosecuted as a terrorism offense. And prosecutions under hate crime or other non-terrorism statutes can result in the same punishment (including, potentially, death) as prosecutions under international terrorism statutes. The United States Sentencing Guidelines also provide for a terrorism enhancement, and that enhancement does not require a conviction under a terrorism statute. Still, describing someone’s actions as meeting the definition of domestic terrorism and actually charging them with terrorism offenses are two different things. Although I’m not sure to what degree these nuances resonate with the general public, I do believe that McCord has put her finger on something important: How a case is prosecuted matters. Factors such as where a case is prosecuted (i.e., federal versus state court) and what crimes are actually charged (terrorism versus non-terrorism offenses) carry moral indicators that signal how we as a society view the alleged harm. To be sure, there is no offense labeled “international terrorism,” just as there is no “domestic terrorism” offense. Like its domestic counterpart in § 2331(5), the term “international terrorism” finds its way into a variety of provisions throughout the federal code and even into regulations, such as those involving financial disclosure requirements (31 C.F.R. § 103.90(b)). But prosecutors do not have to look very far to find statutes that prohibit acts categorized as terrorism when those acts have a foreign nexus. Similarly, the material support statutes offer a well-trodden path for prosecutors when there is an international nexus. 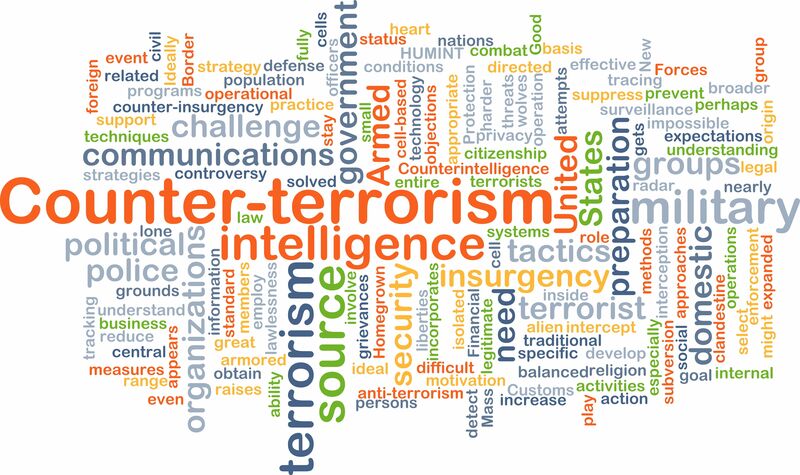 Section 2339B, which makes it a crime to knowingly provide material support or resources to a foreign terrorist organization (FTO), is one of the most useful and commonly used tools for disrupting terrorist networks. It allows for the prosecution of those who contribute to FTOs in any number of ways, including by providing money, logistical support, or personnel (including oneself). There is no equivalent statute prohibiting material support to “domestic” terrorist organizations, just as there is no domestic equivalent to § 2332b. Of course, even those we might call “international” terrorists are not always charged with terrorism offenses. Prosecutors routinely add charges that are not, in a strict sense, terrorism-related. Where appropriate, for example, individuals charged with terrorism offenses can also find themselves charged with other crimes such as money laundering, fraud, kidnapping, or narcotics trafficking. And, depending on the facts, counterterrorism investigations can culminate in charges that do not include a terrorism count at all. The point is that an act of domestic terrorism is not necessarily unique in that there may not be a perfect match between how we prefer to label or categorize the criminal conduct and the offenses that are actually charged. After all, in crafting an indictment for any type of criminal activity, prosecutors generally are concerned with whether the facts of a case match up with the elements of a given offense, not whether the charged offense carries a particular buzzword or falls within a particular chapter of the code. Yet, the imbalance that McCord has identified remains. And as the above statutory examples demonstrate, much of that imbalance results from the relative ease with which prosecutors can employ a statute with “terrorism” or “terrorists” in the name, or which falls within the “Terrorism” chapter of the criminal code, when the criminal acts or motives have a foreign nexus. In other words, the criminal charges brought against an individual inspired by an extremist group located outside the U.S. are more likely to include some type of terrorism-related count than an indictment brought against a similarly situated individual inspired by a U.S.-based extremist group—even if the same criminal tactics are used. By contrast, my former DOJ colleagues charged Sayfullo Saipov—who in October 2017 allegedly drove a flatbed truck down a pedestrian walkway in lower Manhattan, killing eight people and injuring a dozen more—with providing material support to an FTO because he allegedly was acting on behalf of ISIS. Granted, the material support charge is only one of 22 counts (most of which are murder and attempted murder in aid of racketeering), but the fact remains that Saipov’s indictment carries the terrorism label and Fields’s does not. One of the main reasons for the domestic/international imbalance, of course, is the availability of 18 U.S.C. § 2339B when the conduct involves material support to an FTO. Because there is no equivalent statute in the domestic context, prosecutors would have to rely on other criminal statutes for a crime to be categorized as terrorism, and those statutes set a higher bar in terms of the sophistication of the criminal tactics used by the alleged perpetrator. For example, 18 U.S.C. §§ 2332a (“Use of weapons of mass destruction”) and 2332i (“Acts of nuclear terrorism”) are both listed in Chapter 113B of the federal criminal code, which lists “Terrorism” offenses. But such offenses involve the use of methods (e.g., bombs or radioactive materials) that are qualitatively different from those employed by a Robert Bowers (firearms) or a James Alex Fields Jr. (vehicle). As some who are opposed to a domestic terrorism statute like to point out, the other frequently-used material support statute, 18 U.S.C. § 2339A (“Providing material support to terrorists”), which makes it a crime to provide material support or resources knowing they are to be used for certain other enumerated offenses, does not require a foreign nexus. But again, the bar is relatively high for prosecutors looking to bring charges for purely domestic criminal conduct. This is because virtually all of the listed predicate offenses that could cover domestic activity—e.g., violations of 18 U.S.C. §§ 175 (relating to biological weapons), 844(f) (relating to bombing of federal property), or 930(c) (relating to killings during an attack on a federal facility with a firearm or other dangerous weapon)—proscribe conduct that involves a specialized or sophisticated tactic (e.g., bombs, chemical weapons, etc. ), a particular kind of target or victim (e.g., federal buildings or officers, interstate gas pipelines, etc. ), or some other combination of particularized circumstances. The degree to which one views the statutory imbalance as problematic depends in part on the importance one places on labels and, critically, one’s perception of how well current statutes capture the moral culpability of someone engaged in what we might consider domestic terrorism. Some, for example, might ask why charging individuals like Bowers and Fields with hate crimes does not properly capture the nature and seriousness of their offenses. The same question might be asked about Dylann Roof, who was sentenced to death after being convicted of federal hate crimes and other offenses for his murder in 2015 of nine African Americans at Emanuel African Methodist Episcopal (AME) Church. These are legitimate questions. The hate crime laws are serious offenses with serious penalties. They were also designed to address acts of violence and intimidation based on (among other things) a person’s race or religion—in other words, the very kind of violence and intimidation at issue in the cases showcased by those calling for a new statute. If you think of the Tree of Life synagogue . . . this wasn’t about sort of a one-on-one grievance. The Tree of Life synagogue shooter, he wasn’t intending to intimidate just the synagogue, or just Pittsburgh, or just Pennsylvania, or even just the United States. He wanted to send a large anti-Semitic message of hate and of violence. In McCord’s view, a domestic terrorism statute would do a better job than existing laws at capturing the criminal conduct that took place in Pittsburgh because it would better account for the broader ideological motives of the perpetrator. Whether or not one is persuaded by such reasoning, it is clear that that we need to have a more focused debate—and it is time for that debate to make its way to Congress. We need to address whether existing statutes capture the scale and type of violence that, regrettably, we are now seeing on a fairly regular basis. We also need to address whether we are comfortable with the asymmetry that exists in the federal code between how terrorism is defined and how we penalize it. And we need to address the awkward categorical distinctions we make when we prosecute a man like James Alex Fields Jr. versus when we prosecute a man like Sayfullo Saipov. McCord has helped push this debate to the next level by offering the beginnings of an actual proposal. She states that she would base a new law “roughly on current 18 U.S.C. § 2332b,” the statute prohibiting terrorism transcending national boundaries. McCord would criminalize the same kinds of acts listed in that statute (e.g., “kills, kidnaps, maims, commits an assault resulting in serious bodily injury, or assaults with a dangerous weapon . . .”) but would require the acts to be committed with one of the intents included in the definition of “domestic terrorism” provided in § 2331(5). McCord has also recently proposed adding this new offense to the list of predicate crimes used in § 2339A, the statute prohibiting material support to terrorists. The most commendable aspect of McCord’s proposal is that it is relatively measured in its ambition. Because she does not propose a statute resembling § 2339B or any other option that would involve the designation of domestic organizations as terrorist organizations, McCord greatly reduces the odds that her proposal will run headlong into a successful First Amendment challenge. As McCord recognized in our interview, distinguishing between groups that incite or commit violence from those that engage in hateful but protected speech is not always clear, and it is the rare extremist organization that will not engage in some speech that is not protected. By borrowing from two existing statutes, §§ 2331(5) and 2332b, McCord’s proposal is somewhat limited in two other important ways. First, the intent element borrowed from § 2331(5) would help confine the statute’s reach to activity with very specific aims—e.g., to intimidate or coerce a civilian population or to influence government policy by intimidation or coercion. This requirement is in line with traditional conceptions of terrorism, and in fact would impose a stricter intent requirement than § 2332b itself. Moreover, by adopting the acts covered in § 2332b, McCord’s proposal would be limited to particularly dangerous and harmful acts (e.g., killing, kidnapping, etc.). Such an approach conceivably could reduce the risk of improperly targeting individuals who associate with extremist organizations and who engage in constitutionally protected activity, but who do not actually pose a dangerous threat to society. 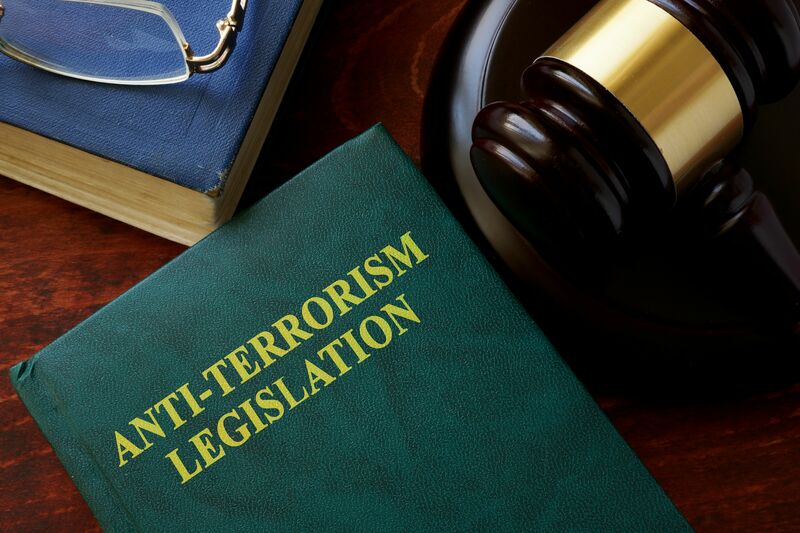 Of course, if a new domestic terrorism statute were included among the predicate offenses listed in § 2339A, the statute prohibiting material support to terrorists, there is a risk of eliminating some of the benefits of such a carefully calibrated approach. What are the downstream consequences, for example, when law enforcement begins investigating an individual or organization that may have sold goods or provided a loan to a person who may be in the early stages of planning an act qualifying as domestic terrorism? How will adding this new predicate offense to the material support statute affect the use of confidential informants within the United States? I have the greatest confidence in my former colleagues at the FBI and other federal agencies—they are true professionals with enormous integrity—but the further a criminal statute strays into the territory of inchoate offenses that are removed from the acts themselves, the greater the risk of overreach. This brings me to the most important question about any proposed new law: How would it be executed in practice? More specifically, when we apply the law to criminal acts beyond those resembling the Tree of Life Synagogue shooting, what crimes will we be prosecuting as terrorism that we did not prosecute as terrorism before? Even a proposal as carefully considered as McCord’s leaves ample room for interpretation by prosecutors and agents considering which crimes should qualify as terrorism. For example, would the kidnapping of an ordinary citizen belonging to a particular political party be charged as domestic terrorism if the perpetrator had a financial motivation, but it could later be shown from the perpetrator’s diary that he was also trying to send a message to Congress? What if the victim was executed after he or she was kidnapped? Would the answer to either of these questions be different if there were 10 victims? Just as importantly, what categories of crimes would not be covered? As McCord explained in our interview, events like Stephen Paddock’s decision in October 2017 to open fire on a crowd of concertgoers on the Las Vegas Strip would not be covered by her proposal because it cannot be shown that he had the broader political motives that the statute would require. Nor would most of the tragic school shootings that we have seen in recent decades. If we as a society are ready to place into the terrorism category James Alex Fields Jr., who killed one person (and injured many others), are we comfortable leaving out of that category Mr. Paddock, who killed 58 people and left more than 600 injured? Because of these and many other questions that relate to implementation, I am heartened by the suggestion offered by McCord and Blazakis in their recent post that “any domestic terrorism statute should come with appropriate oversight requirements.” They suggest annual reporting requirements by law enforcement that reveal the details of every domestic terrorism investigation that is opened, including what individuals or groups are targeted and why. Such measures may be sufficient, or they might not, but they have to be part of any meaningful discussion about a new law. McCord and Blazakis raise another critical point. It is imperative that Congress take up the issue of domestic terrorism not simply to decide whether we need a new criminal prohibition, but also to better understand the problem itself. I could not agree more. Whether or not one thinks we need a new law, it is clear that we can improve upon what we are doing now. And we can’t begin to do that until we have a clear-eyed sense of today’s domestic terrorism threat and how it is being addressed. Information on the source and nature of threats that might qualify as domestic terrorism, hate crimes, or both would go a long way in helping us make cleaner analytical distinctions when talking about these threats and deciding how to address them. It would also help us better compare these threats to those posed by individuals acting on behalf of FTOs. Only with complete and accurate data can we assess how to better calibrate our current law enforcement priorities and resources and determine whether statutory fixes—in the form of better record-keeping requirements, new criminal prohibitions, or some combination of these and other measures—are required. I applaud McCord, Blazakis, and others for pushing this conversation forward. It is now Congress’s turn to take it further. As we like to say on Lawfire®, check the facts, assess the law and arguments, and decide for yourself! Do all trial lawyers agree that the obstruction of justice case against Trump is “open and shut” and a “slam dunk”?